^ Podhorodecki, Leszek. 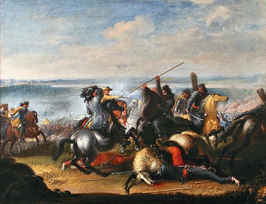 Chanat Krymski i jego stosunki z Polską w XV–XVIII wieku. 1987: 196. ISBN 83-05-11618-2. ^ Subtelny, Orest. Ukraine. A history new. CUP Archive. 1988: 104. ^ Frost, Robert I. After the Deluge. 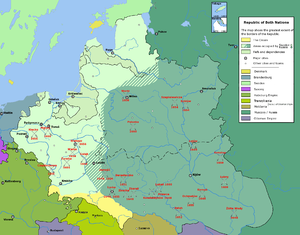 Poland-Lithuania and the Second Northern War, 1655-1660. Cambridge Studies in Early Modern History. Cambridge University Press. 2004年: 第3页. ISBN 0521544025. ^ Zawadzki, Marcin. Durham University Polish Society. 达累姆大学. [2009-06-23]. （原始内容存档于2007-08-21）. 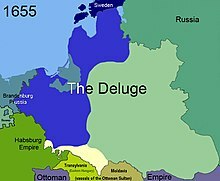 During 'The Deluge', Commonwealth lost an estimated 1/3 of its population (proportionally higher losses than during World War II), and its status as a great power. ^ Max I. Dimont, Jews, God, and History, Signet Classic, 2004, ISBN 0451529405, 第247页.